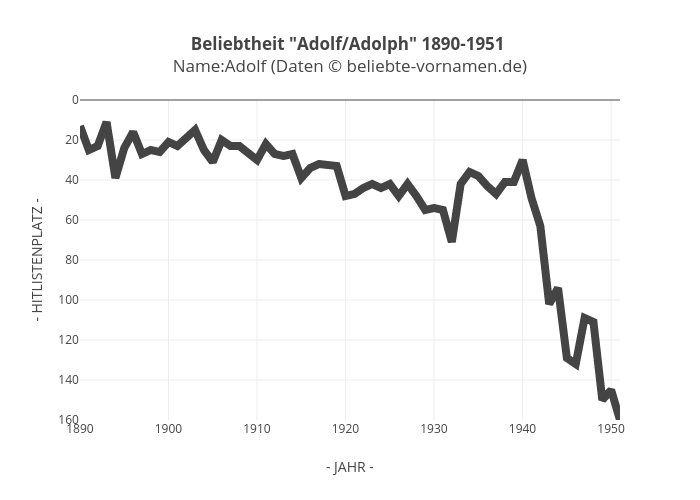 Nameadolf's interactive graph and data of "&lt;b&gt;Beliebtheit "Adolf/Adolph" 1890-1951&lt;/b&gt; &lt;br&gt;Name:Adolf (Daten © beliebte-vornamen.de)" is a timeseries, showing B; with - JAHR - in the x-axis and - HITLISTENPLATZ - in the y-axis.. The x-axis shows values from 1890 to 1951. The y-axis shows values from 160 to 0.